In order to scale your car properly it must be ready to go. For the most accurate results the car must be fully prepared. If it is not "race ready" then any changes that you make will have an effect on your final setup and what you have put in your notes. So, what do you need to have done to be "race ready"? "Race ready" means that the next thing the car will do is go around the racetrack. Keep in mind the changes that will be made to the weights if you attempt to scale the car before it is ready to go. 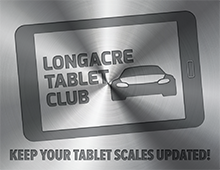 Now that you have the car properly prepared you can get the scales out to begin the scaling process. Lay the pads flat at each corner and plug in the corresponding cable. Double check that the cables are plugged in correctly or you will waste a lot of time reading bad numbers. Let them warm up for two or three minutes. 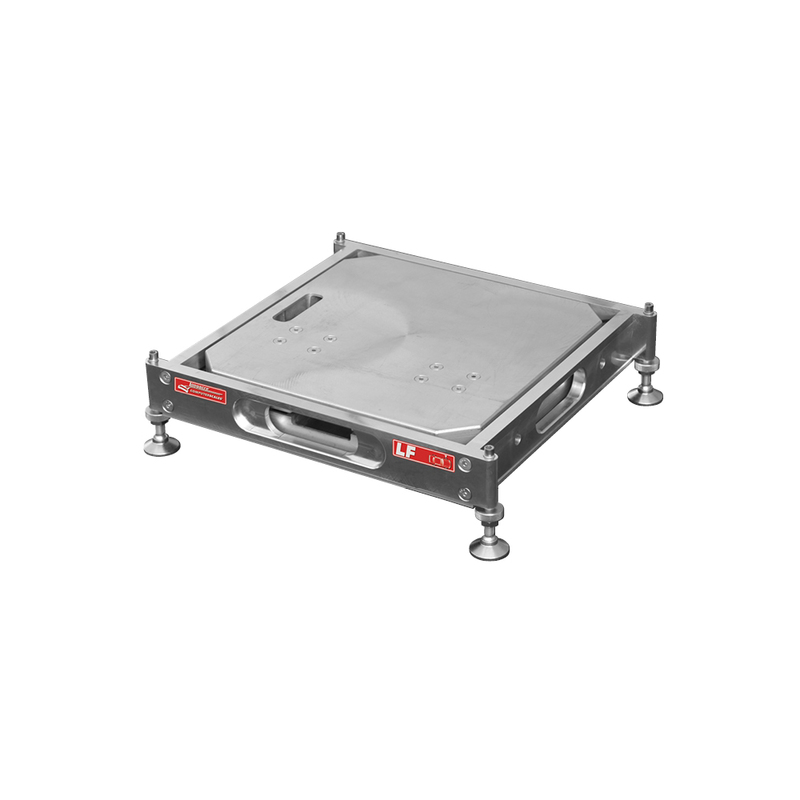 Once the cables are plugged in and your scale system is turned on, press the zero button and insure that each corner weighs zero with the pads flat on the ground. The pads must be flat or you will not zero out the top casting. Verify that the scales do not need charging. At this point have one of your crewmembers stand on each pad. He should weigh within a pound or two on each one. If all is well, then check that the scales have returned to zero. At this point jack up the car and slide the pads under each wheel. To insure that you get the same results each time you must go through the same routine each and every time. Since you just lowered the car onto the scales you need to work out all of the chassis binds, hysteresis and scrub from the tires by going through a settling routine. You can do this by firmly bouncing the rear of the car, then bouncing the front, and then shaking the roof bar above the driver's head. Try to let go in the middle each and every time. Roll off type trays help as well, but some very successful teams do not use them. Either way, if you go through the same routine each time you will get great results. If you make an adjustment to the wedge, move lead, adjust stagger or make any other adjustment, you will need to go through the settling routine to insure repeatable results. Once you get your favorite set up in the car you are almost done with the scale job. Write it all down in an organized fashion and now you are completed and ready to win. In order to be fast each and every week you must keep good notes. 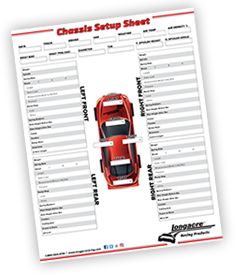 Be sure to write down your scale readings as well as the shock, spring, sway bar, Panhard height, linkage angles, arm lengths, stagger and all other pertinent information. It is one thing to be fast. It is another to know how you did it and to be able to repeat the process. 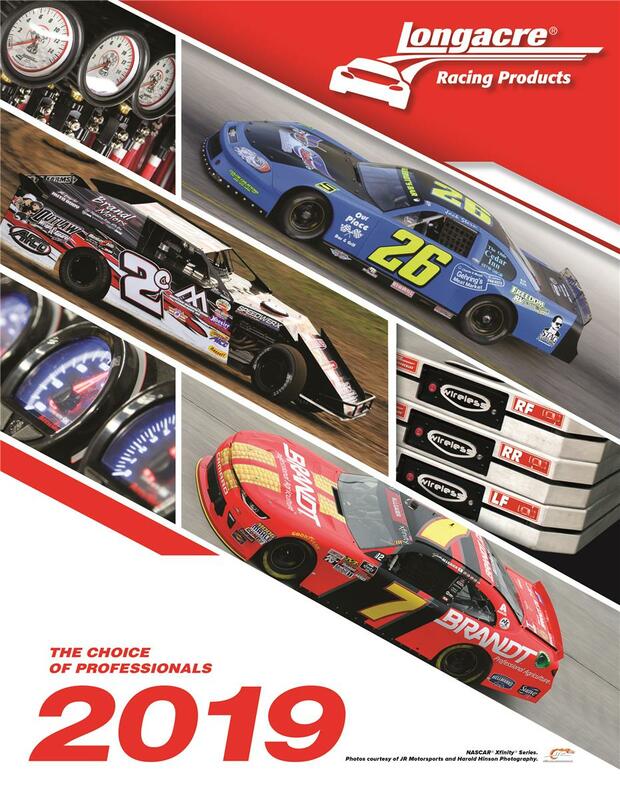 Once you get to the track be sure to note each change and the results including lap times and number of laps run. You should assign a person to this task that is there every week and is detail oriented. Get a form to keep the information the same way week in and week out. When you scale at the track you must find level ground or your readings will be off. You can short cut the system by getting 2 strings and four guys. Have the guy at the RF hold one string and another guy hold the other end at the LR. Have a guy at the LF and another at the RR each holding another string on opposite ends. The strings will now make an X in the center. If the top string is higher than the bottom string then the other two pads will need to be shimmed up. If the top string holds down the bottom string then those two pads need to be shimmed up. By using this stringing process the pads will be placed in the same plane. They may not be quite level, but by being in the same plane your cross weights will be correct. Another trick is to find fairly level ground upon arrival at the track. Right when you get there, weigh the car. Mark the ground by tracing around the scale pads with chalk. If your scales have memory you can get in the habit of putting your shop set up in memory one and then put the track reading in memory 2. You can now compare the bite between the shop and the new reading taken at the track. If the track reading shows 1 percent more bite you will know that the ground is out of level by that amount. By knowing the difference you will have a baseline to return to if needed. Scales must be exactly level in order to get perfect results. However, the two methods described above are short cuts that get the job done without too much compromise. Should you want to change a spring at the track you will want to use the scales to insure that you have made only a spring change and not a cross weight change at the same time. Set your air pressure and then weigh the car and take a reference height measurement from the fender or frame rail down to the ground. Write the scale numbers and reference number down. 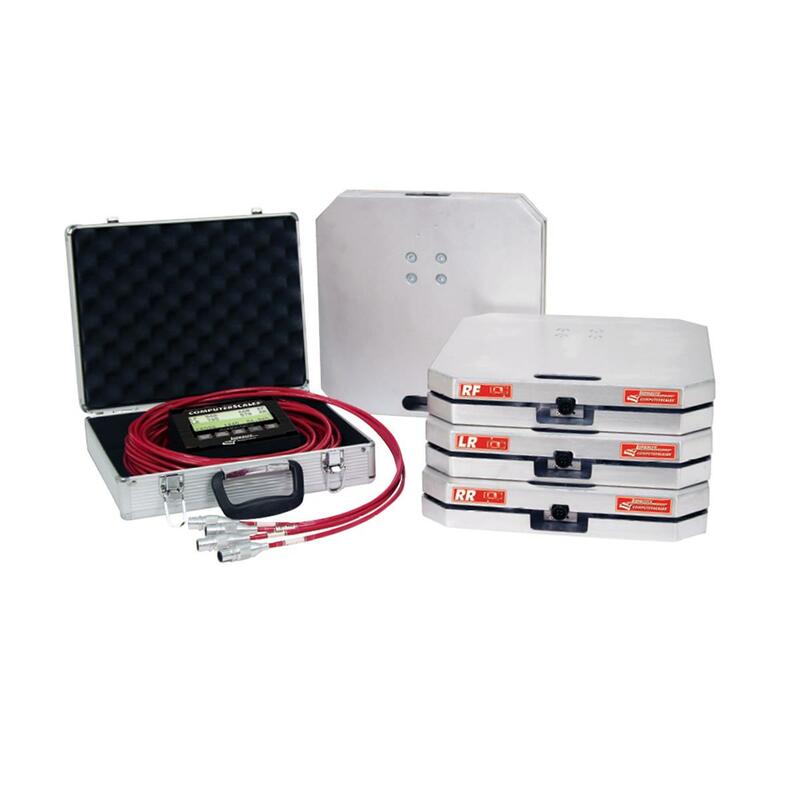 Infrared pyrometers measure only the surface. The surface will be cooler as heat is dissipated off the surface very quickly due to the outside air cooling and simply rolling across the cooler track temperature. Typically the surface temperature is 20-40 degrees cooler than temperatures taken with a probe. Infrared temperatures will also be affected by artificial brake heat and engine heat. You can then change the spring. I like to measure the free height of the spring that is going in and compare it to the one that is coming out. Let’s say you have a 400-pound spring in the RF and you are going to change to a 375. The 400 is 12 1/8" and the 375 is 12" exactly. You can estimate that the 375 will need about 1/8 more pre-load to maintain ride height (1 turn on coarse thread coil-overs or 2 turns on fine thread) then add in the free height difference. You will now be in the ballpark. Verify your reference number to the ground and then weigh the car. Fine-tune the adjuster until the scale numbers come back to the original bite numbers. I even chart my springs so that I know how many turns to put in or out when I go from my numbered 375 to a different numbered 400. The chart allows me to change springs when I am in a hurry and am unable to get the precision offered by weighing the car to get the bite back. Basically, I do the work in the shop to save valuable practice time at the track. Many times changes happen fast and furious at the track. Each week you should fill your car with fluids upon arrival back at your shop. You have to fuel up to do the setup for the next week so you might as well get in the routine of doing that early in the week. Set the air pressure and weigh the car. Take good notes and you will insure that you will get consistency when you return to the track that you just ran over the weekend. 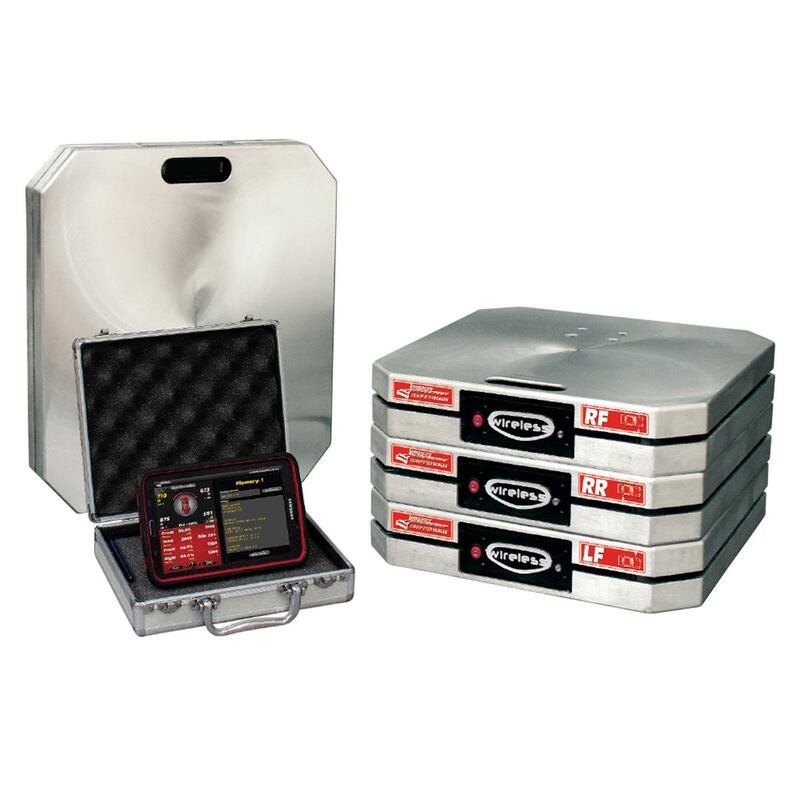 Many scales with rechargeable batteries are designed to work on the battery as long as it is charged up. By running on the battery you will extend the battery life. Battery design life is two to four years. By running on battery power you will get a stable consistent supply of power to your system. If you get a low battery indication you can plug into 110 Volt power and finish the job. By running on the battery you will extend the battery's design life. Should you choose to plug in all the time this will work fine as well. However, more heat will be generated in the battery thus reducing the battery life span. I recommend running on battery power whenever possible. Wedge will change due to a variety of things that are explained below. When you notice a wedge change, have a look at the total weight. If the total is the same then odds are your scales are operating fine and there is something in the car that needs correcting. If the total changes by more than a few pounds then you could suspect a scale problem and should call the manufacturer for more direction. Cars that run high amounts of stagger and a locked up rear end can experience changing wedge due to the tires getting ready to "skip" like when you are push through the pits around a tight turn. Weight will momentarily be miss-applied as the tires excerpt force through the rear end gears. The axles literally climb up the ring gear causing an occasional wedge variance. To avoid stagger effect problems simply remove an axle cap and pull an axle out past the spline on the rear hub. You can even see the stagger affect on cars with differentials however it is less common. Sometimes A-arms can be in a bit of a bind to get the caster right. This usually happens when more shims are used on one A-arm bolt than the other. You can see wedge numbers change due to this added resistance. Try to avoid uneven shimming and be sure to keep your A-arms greased at all times. Ball joints have a fair amount of friction and need to be greased often. The friction can cause wedge variations if the car is not settled properly. Damaged ball joints should be replaced. When weighing your car or making spring changes you should always have the sway bar disconnected. Many of the wedge variances I hear about are due to sway bar binds. I connect the sway bar only after the weigh process is completed. On late models I like to load the bar with 1/2% of wedge. On Cup style cars I like the bar to be completely neutral. You can set the bar to your liking but try to do it the same way each time and note your weight readings with the sway bar load if it is not set to neutral. When you adjust camber you are changing the tilt of the tire. Adding camber changes the wedge in the car to a small degree. Keep this in mind when recording your weights. If camber is changed, wedge will change a bit as well. Shocks with high amounts of rebound can artificially hold weight in a corner, especially when cold. Settling the car usually works the hydraulic fluid to get consistent readings. However, high amounts of rebound can make the weighing process harder. If possible, disconnect the shocks. On coil over type cars settle the car thoroughly. Air pressure changes moves cross weight and will change the numbers on all four corners of the car. Be sure to have the air pressure set before you begin the weigh job. I have seen slow leaking tires or bleeders that are still bleeding cause the weigh job to be a real hassle as the wedge keeps moving every time you check it. Be sure the tires hold air before you begin. Make sure the stagger is set. More rear stagger takes bite out of the car. Less rear stagger puts bite in the car. More front stagger puts bite in the car. Less front stagger takes bite out of the car. Make sure you do your shop set up including ride heights with the proper amount of air pressure and tire stagger. Total weight changes indicate that something is interfering with the free movement of the top casting on the scale pads or there is a problem with your system. I have seen Cup teams make leveling trays that rub the sides of the top castings on the scale pads. The interference can cause weight variances in the 30 pound range. Make sure that the top casting on your pads is free to move. A damaged or smashed cable can cause the numbers to bounce. Inspect the cable for damage. If damage is found order a new cable. If you are in a bind you can do a quick repair job. Insure that the system is off and cut the bad section out of the cable. Splice the wires together color to color and tape up. The quick repair will get you by until a new cable arrives. If water gets in the scale connectors the moisture interferes with the scale signal and a bouncing will occur. The fix is to dry out the connectors with a heat gun or put them over a heat register over night. Usually, the system returns to normal when the connectors dry out. A dead battery will cause many different problems. If you experience any kind of trouble then replace the battery or plug the scales into 110 volt and see if the problem is cured. Extremely dead rechargeable batteries might require some charging before the system returns to normal operation. Old batteries can short out internally and can interfere with proper scale operation even when plugged into 110 volt power. Design life is typically 2-4 years for rechargeable batteries. Liquid crystal displays will disappear when exposed to direct sunlight. At times people think that scale has suffered damage. Avoid leaving the scales or any liquid crystal product in the sunlight. To cure the problem simply put the item in the shade. When the LCD cools down the numbers will reappear.